This week: This time, I think about the internet and how important it has become for my life. A fast access to the internet can be seen as one of the standards these days. I would go even that far and compare it with the standards of being supplied with electricity and fresh water. However, I am experiencing an internet outage for more than a week now (my Internet Service Provider apparently is not really fast in fixing such a problem) and this becomes really problematic as my work requires an access to the internet. Without the internet, I am not able to communicate, to do research, nor to exchange data with others. Especially being not able to receive and to send emails is really problematic as there are several upcoming projects that require some preparations. Of course, having a constant access to the internet has also some downsides. For instance, I do receive a lot of messages throughout the whole day. On the one hand, this is really important as I rely on this communication. On the other hand, receiving a new message can, depending on the importance of this message, distract me from my current work. However, I am quite skilled in setting my own priorities which helps me to stay focused and to be productive. Moreover, if I really need a break from the 24/7 availability, I just can leave my desk for some hours and spend some time outdoors in order to relax a bit. Apart from the whole „working on the internet“ aspect, the internet is my main source for information and news. Naturally, I can get some of these information also via other means (e.g. watching TV), but most of my interests are not covered by these other media services. Furthermore, these other media services follow a fixed schedule, whereas I am used to the „information on demand“ service of the internet. Finally, the internet outage also changed my workflow. Usually, I am multitasking all the time in order to complete several tasks as efficiently as possible. This could be as simple as keeping uploads and downloads running while I am researching some facts on the internet for a project I am currently working on. In most of the cases, my workflow aims at using the maximum performance of my internet connection. Furthermore, I am used to just search for a fact or a solution on the internet when I am getting stuck at some point. Obviously, this approach does not work without the internet. Now, I try to focus on one task and, as soon as I encounter a problem, I have to add it to a to-do list in order to check all the issue at once in one of the rare moments when I visit someone who can provide me with an internet access. In general, the internet outage made me realize how important the internet has become for my life. Sure, I can live without the internet and it is really relaxing to step away from it for a certain amount of time. However, my current life is dependent on a constant access to the internet and this becomes really obvious in times of an internet outage. This week: This time, I think about SpaceX’s second attempt of landing the first stage of their Falcon 9 rocket on a barge. After a one day weather delay, SpaceX launched a Dragon spacecraft on top of a Falcon 9 rocket into orbit on Tuesday. The Dragon cargo craft itself is loaded with 2.2 tons of supplies and experiments heading for the International Space Station. About 9 minutes after liftoff, the Dragon was deployed into a stable orbit around the Earth and unfurled its solar arrays. While the Dragon cargo craft was deployed into its initial orbit, the first stage of the Falcon 9 rocket was descending back to Earth. Normally, the first stage of a rocket is used only once, falls back to Earth after it is burned out and plunges into an ocean. However, SpaceX works on a concept to reuse the first stage of their Falcon 9 rocket to reduce the launch costs. SpaceX’s final goal is to return the first stage back to a safe landing area next to the launch pad after the stage has completed its job. Currently, SpaceX evaluates the rocket’s descent system and tries to land the booster on a stationary platform in the Atlantic Ocean. For this purpose, the first stage of the Falcon 9 rocket was equipped with four landing struts, variable thrust engines and aerodynamic girder fins in order to control the descent back to Earth. Tuesday’s launch marked the second time SpaceX has tried to land a Falcon 9 first stage on a barge. The first attempt to land the booster after a launch on January 10th worked nearly perfect until the aerodynamic girder fins ran out of hydraulic fluid just before the landing and, as a result of this, the first stage crashed on the barge. This second attempt was almost successful and the first stage managed to land on the platform. However, the first stage had some lateral momentum at the moment of the landing. Although the thrusters tried to stabilize the rocket after touch down, the horizontal momentum was too strong and the booster flipped over resulting in an explosion. SpaceX came one step closer to their goal of making the launcher’s first stage reusable. This week: This time, I continue think about the different ways of controlling a computer game and why it might be important to come up with a new control device. In Finding of the week #107, I wrote about the innovative game mechanic of selectively controlling the arms of B.U.D. in Grow Home. Furthermore, I wrote about the control standards of computer games and how gamers got used to navigate through the virtual worlds by harnessing their mouses and keyboards. These control standards are an ideal solution for the majority of the current games. It becomes almost natural to move through the virtual world via keyboard inputs, while looking around or focussing on one spot is performed with the mouse. Additionally, the mouse buttons are used to trigger certain events like activating switches or shooting a weapon. Some computer games are played from a static camera angle and can be even played without the mouse or with a game pad. However, there are also some games that utilize different control standards that allow the precise control of special parts. These games are mostly simulation games such as flight simulators or racing simulations. Players of these simulation games like to accurately control their vehicles and enjoy playing these games with special devices like a joystick or a racing wheel. The simulation control standards allow the direct control of all the different elements of the simulated vehicle like all the different aerodynamic control surfaces of an airplane. Apart from these simulation games, most games realize movement as a continous flow that is triggered by keeping one key pressed. Players do not need to seperately control the different body parts of their avatars. They just need to trigger a certain activity in order to fully perform it inside the game. Innovative games like Grow Home demonstrate the limitations of the control standards. Controlling both arms of B.U.D. via the two main mouse buttons works well, but it is still a strange feeling of utilizing both of his arms with only one hand. The developers of this game recommend playing it with a game pad. This allows the control of each arm with the respective hand, but it is still a step away from becoming a natural feeling. Grow Home has presented a new way of interacting with the game world. Now, I am looking forward how this approach will evoke some new control devices that allow a more realistic control of our virtual avatars. This week: This time, I think about the game mechanic of being required to selectively control the arms of B.U.D. in Grow Home. Computer game players control the actions of their avatars during the gameplay of a computer game. In most of the cases, the avatars can walk, run, jump, croach, climb, carry around objects or activate switches in the game world. Instead of being required to control the avatar’s limbs, the players just have to press the respective key in order to perform these actions with the own avatar. Although the avatar control is not a full body control, it never felt strange to me. The reason for this could be that all of these activities are daily life activities and they are normally performed without a conscious effort. Our own decision to perform one of these activities subconsciously triggers the execution of it. Controlling an avatar in a virtual world shares similarities with our own natural way of moving through the world. Recently, I discovered the computer game „Grow Home“ and started playing it. 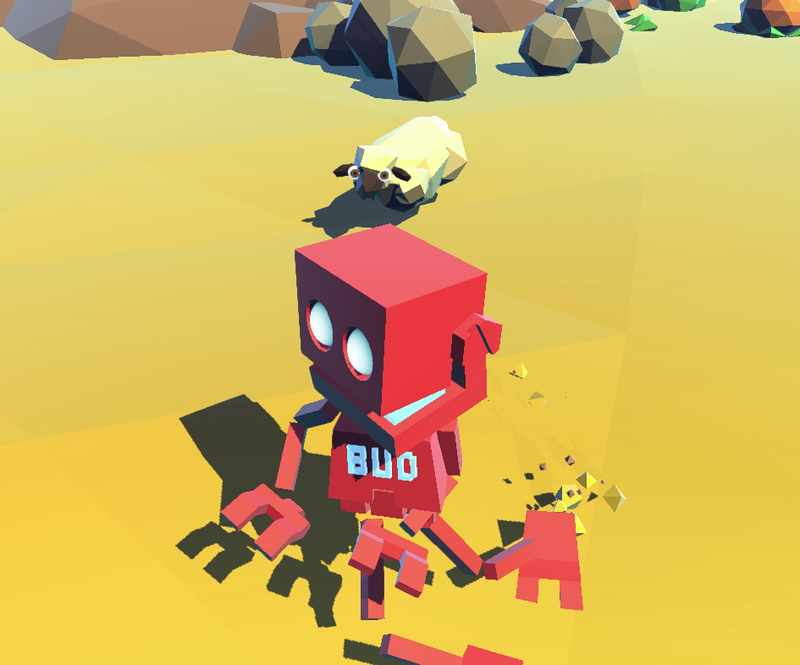 In Grow Home, the player takes control over a droid called B.U.D. which has the task to grow a plant to a certain height by connecting its shoots with energy sources. The game is played from a third person perspective and follows to a certain degree the usual control standards. 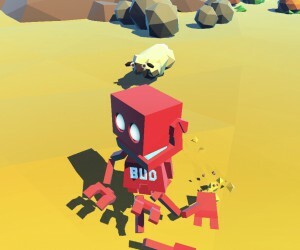 However, Grow Home introduces a new way of controlling the arms of B.U.D.. Players are required to selectively use the left or the right arm in order to climb up high walls or to carry around an item. Depending on the used peripherals, the player has to select the arm by pressing the respective key. In the case of playing the game with a keyboard and a mouse, the player has to press the left mouse button to activate the left arm and the right mouse button to activate the right arm. If the player likes to grab an item with B.U.D.’s left arm, he has to approach this item (pressing „W“ lets B.U.D. move forward) and then press the left mouse button in order to finally grab the item. Climbing up a wall requires the timed combination of both armes while performing a forward motion which is initiated by keeping the W key pressed. Furthermore, the player has to make sure that B.U.D. has always a firm grip at the wall. 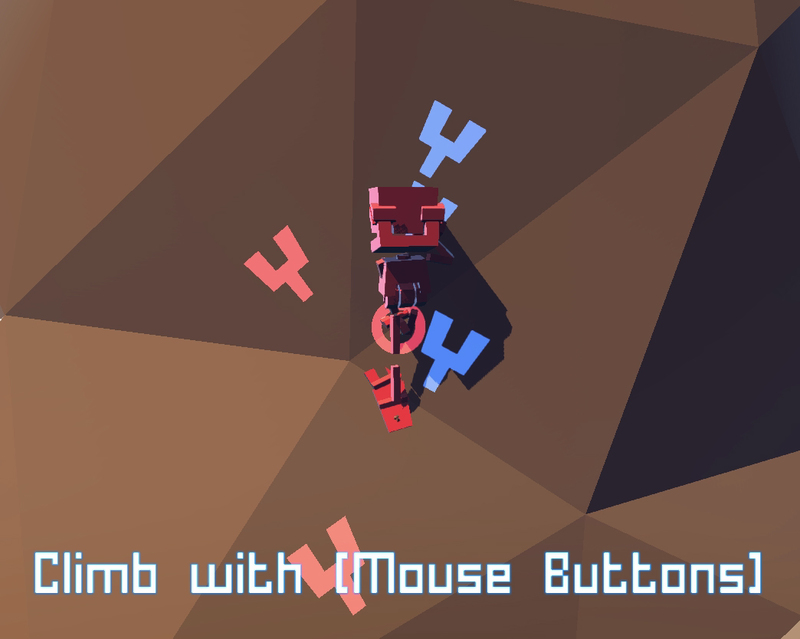 In order to climb up a wall, the player starts with pressing the left mouse button when B.U.D. stands in front of a wall in order to grab it with the left arm. Subsequently, he starts to move upward by pressing the W key and finally he has to press the right mouse button in order to grab the wall at a higher position with the right arm. After having a firm grip with the right hand, the player can release B.U.D.’s left arm, move upward a bit and finally grab the wall with the left arm again. In summary, the activity of climbing upwards is performed by keeping the forward button pressed and alternating between the two arm control buttons. This special way of controlling B.U.D. can even allow the players to get into a state of „flow“. At first, this new game mechanic of controlling B.U.D.’s arms felt a bit strange, but over time I got used to this mechanic and it even enhanced my experience of controlling an avatar in a computer game. Being required to actively alternate between B.U.D.’s two arms resulted in a completely new dimension of interacting with the virtual game world.